Four all-natural products to care for sun-drenched skin and hard-working hands. Whether you're a seasoned green thumb or just a seedling starting out, gardening is a labor of love. Tend to hard-working hands and exposed skin with these four products crafted in small batches with all-natural ingredients: bug repellent, cooling mist for hot days, and pumice soap and a vegetable-fiber nail brush for dirty hands after a day of planting and pruning. Handcrafted by Marit Aagard and Jeff Lovett in Pittsburgh, Pennsylvania. Lovett Sundries was started by Marit Aagaard and Jeff Lovett out of their home in Pittsburgh Pennsylvania after they noticed that even most “natural” body care products available were over-hyped and over-engineered. They started by making their own extra gentle soap bars using old fashioned techniques and ingredients they could pronounce. After several years of inventing and refining for family and friends they had accumulated a serious collection of tools and recipes. Whether you’re a seasoned green thumb or just a seedling starting out, gardening is a labor of love. Tend to hard-working hands and exposed skin with these four products crafted in small batches with all-natural ingredients: Bug repellent, cooling mist for hot days, and pumice soap and a vegetable-fiber nail brush for dirty hands after a day of planting and pruning. At Lovett Sundries, we are excited about making your everyday routine special again with our finely crafted apothecary stock. After asking what was in the soap we bought at the store, and not liking the answer, we started making our own extra gentle bars using old fashioned techniques and ingredients we could pronounce. Our friends and family loved our soaps, and begged us to make more. That’s what got us into the sundries business. Now we feature a line of handcrafted soaps, grooming, and cleaning products that are carefully measured, mixed and packaged by our own hands. We like doing things the old-fashioned way; it’s slower but more satisfying, and in the end, it makes our products better and more meaningful. We are a family company working out of Pittsburgh, Pennsylvania. Our wares do more than work and feel great; they can be savored and enjoyed with pride in knowing that you are supporting real people making real things. From our family to yours; you’re going to love it! Lovett Sundries pays employees a starting wage of $15/hr., which exceeds Allegheny County's living wage. Lovett Sundries only employs a short term, seasonal, part time work force and does not offer Paid Time Off. Lovett Sundries' primary materials are all natural ingredients consisting of oils, minerals, and beeswax. All primary materials are used up over the life of the product leaving only the packaging to be recycled. Lovett Sundries provides the following in charitable giving: a. Center for Contemporary Craft – Yearly donation of products for silent auction. b. Creative Reuse – Yearly donation of products for silent auction. c.	Girls Rock – One-time donation of products for silent auction. Lovett Sundries uses all natural ingredients. Packaging is primarily glass and paper. Everything is recyclable except for the safety shrink-wrap and spray top on spray bottles. 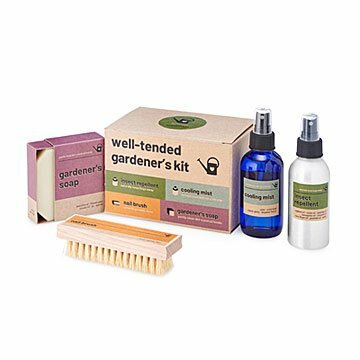 There's one place—and only one place—where you'll find the Well-Tended Gardener's Kit: UncommonGoods. We gave this gift to Grandma for Christmas because she volunteers at the Dooryard Garden of her local history museum. She was very excited and looking forward to using all the items this Spring. mostly pleased with my order, but very disappointed with the gardeners product. Buying these for all the gardeners in my life! Perfect products that I'll truly use, and I can't rave enough about the packaging! Glass, metal, and paper - what can't be reused can be composted! And in the hot sun, with dried hands, all of the products in this lovely gift will be a welcome addition to my gardening routine! I would buy definitely buy this item again! My friend loved this gift! She spends her downtime gardening and found all the items in the kit very useful. She said she uses them once she is finished gardening to clean and refresh her hands. She was delighted with this gift.